Date of birth: 98,038 years before Western civilizations calendar began, November tenth. Assumed human child form in the end of BD30's (early 1960's), at the home of the Coglay Family in Tokyo. Stayed on as their son. BD32-30(1967-'69) : Went overseas with His Excellency (HE) 's human father who had been transferred to New York. BD29-18(1970-'81) : Began HE's studies of the human race and its various art forms, based largely in Japan. BD17-18(1982-'83) : Began taking acting lessons at a Tokyo acting school. Graduated with full honors. HE accomplished this within a time margin that was, and still is, considered short, indicating HE's natural talent. HE was immediately registered as a professional actor and guild member. BD17('82) December : SEIKIMA II (pronounced say-ki-mah-tsu , meaning the end of century ), the group of demons masquerading as a rock band, is formed with HE on vocals. BD14('85) September : Their debut album(on the Earth) is released from CBS/Sony records in Japan. BD13('86) March : HE graduates with honors from Waseda University with a degree in social science. BD13('86)- DC01('99) : Basking in steady popularity. *The Devil's Calendar（DC）began at Western civilizations calendar 1999. 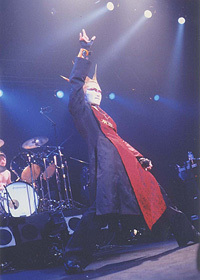 DC01('99) December 31 : SEIKIMA II performs their last black mass (like as a concert) and says good-bye to their fans. Being the end of the century, this was always considered with foresight as the ideal time for the members to go their separate ways. 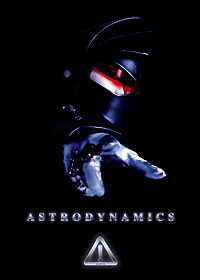 DC02(2000) January : His Excellency begins expanding his horizons by adding performances in new media and entertainment forms to his vast repertory of successful endeavors. It was in this year that officially HE declares the world to be his conquered territory and having accomplished that, proceeds to flood the media with his messages as entertainer, cinematographer, choreographer, writer, essayist, philosopher, journalist and a leaser of a very lucrative name. * In BD16('83) His Excellency won the Godzilla roar-alike contest. * In BD13('86) HE won the national best all-around entertainer award. * It is also well known that HE is a Sumo wrestling fan and Critic, having published a column devoted to the sport in the magazine VANVAN Sumo Club for thirteen years, also having a regular commentary seat at Gekisen Ohsumo the TV Sumo program for five years. HE is frequently featured in all major media: television channels, including NHK the national broadcast association: newspapers, including Asahi, Yomiuri and Mainichi as a commentator and critic. * HE's radio show All Night Nippon was on the air for 3 years and received recognition for being the number one rated radio talk show in BD10('89). * HE also took part as a commentator on TBS's (Tokyo Broadcasting System) national senate election coverage special in BD09('90). This is also a first for musician. * In BD09('90), Sony Toys released a product known as Mr. AI-NO-TE which was a talking voice-changer toy featuring His Excellency's voice. HE's voice was also used at various amusement park attractions, planetariums and exhibitions. * In BD07('92) , due to his involvement with the British F-l circuit racing team Brabaham, His Excellency's face was the first celebrity face to be featured on the official team car. * In BD07('92) , His Excellency became the first celebrity to have his likeness made into plush dolls and madeavailable to the Crane-claw machines made by Takara for video game arcades. These dolls were available only in these machines and were quickly maneuvered out by collectors in record time. * In BD05('94), HE was featured on the Larry King Live show on CNN. His Excellency was the first Japanese musician to be interviewed by Mr. King on his show. * In BD02('97), His Excellency composed the entire soundtrack for the game entitled G.O.D (Growth or Devolution) for Super NES and Playstation. * In BD01('98), his Excellency's image was featured in the Sankyo pachinko machine series Sankyo CR Fever Demon. HE has been featured in numerous commercials, most notably for Fuji Color Films. HE's role in this commercial series garnered him the best celebrity featured commercial prize. HE has also featured in a government anti-drug campaign commercial, as well as commercials for Microsoft and Mobile phone. HE's television appearances featured not only musical performances but also frequent guest spots on comedy shows in which he performed in sketches. He is noted for being the first rock personality to do this on Japanese TV. HE considers Japanese historical performance art forms such as Kabuki and Noh to be his life's ongoing work, as he has done extensive research of these art forms. It was HE's passion for these art forms as well as rock music that led to his creation of the Bibai Festa (Bibai city Art Festival, which featured an eclectic mix of modern music and Kabuki) which was held every summer from BD11('88) to DC02(2000), entertaining over ten thousand spectators every year. It should also be noted that concert event of this type. His Excellency, as a solo artist, continues to write and produce rock/pop music, having released 8 albums and having performed in 5 nationwide solo act tours. His Excellency put together over-50 concerts, entitled H.E. Demon Kakka's Revolutionary Collaboration Of Traditional Japanese Instruments, featuring a combination of contemporary rock, pop and various traditional Japanese instruments; each concert featuring one such instrument: Shakuhachi Bamboo flute, Soh(thirteen-stringed horizontal harp), Biwa (Japanese sitar), Japanese Wadaiko Drum, Shamisen, (three-stringed Japanese banjo), etc.. These shows were attended by over twenty five thousand fans. Having had many collaborations with orchestras throughout his career, His Excellency had a concert in August of DC4(2002) entitled Demons Night which featured the New Japan Philharmonic Orchestra. HE's television appearances have featured not only musical performances but also frequent guest spots on comedy shows in which he performed in sketches. 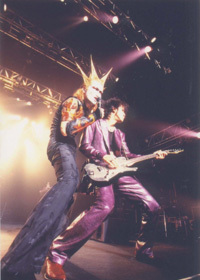 HE is noted for being the first rock personality to do this on Japanese TV. * In autumn of DC3(2001), HE appeared on an NHK(Japanese public broadcasting) special TV program about Rock History, as a main personality. For this, HE went to Ireland and the UK in August of that year. HE then went to the USA in September. HE left NYC on September 10th. From Jul. DC02(2000) to Jun. DC04(2002), HE had his own news commentary show(Journal A) on Asahi Newstar Television, in which he was the main newscaster. This show was aired every Friday during prime time for 2 years. This, again, was a first for a rock personality. * HE is regularly featured as a musical advisor, sociological commentator and/or columnist for many magazines, most notably: AERA and Weekly Asahi Magazine. * HE continues to be in popular demand for his speeches and seminars. HE lectures about 3 or 4 times a year, having been asked to speak by such sponsors as Waseda University, Dentsu company (the largest advertising agency in Japan) and Defense League Medical College and NHK. From Jul. DC04(2002) to Feb.DC05(2003), HE studied motion picture direction in L.A..
His Excellency is also known as a stage musical actor, and have performed in many plays. * HE produced the rookie progressive-hard rock band SHING in DC06 to DC07(2004 to 2005). Their music is dramatic and, their poetic songs are all sung in English. * DC08(2006) HE wrote and sang a song untitled " L R" for the compilation album: A Tribute to Death Note. 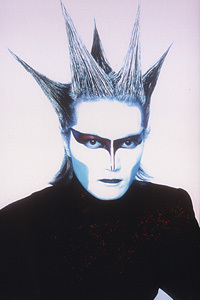 From March to September in DC07(2005), HE was featured as the main personality of JOLF: Nippon Broadcasting radio program "Radio Vegas",a two- hour show aired every weekday evening. During this season, HE also appeared on the musical stage , as well as composing and recording songs for his own band. In DC05(2003) HE starred in the musical short movie," Jibun Nari"(NIZOO). This is HE's first starring role in a motion picture. This movie was awarded an honorable mention prize at the Hoston International Short Film Festival. In DC09(2007) His Excellency's new carrier began. HE directed his first motion picture "Kona Nishite Fuu". The movie was shot in Missouri, USA and Japan. In DC10(2008 Feb. to May) the movie was shown in theaters across Tokyo and Osaka. It was very well received. In DC08(2006) and DC09(2007) HE recorded two albums worth of songs with Anders Rydholm, the Swedish musician, member of Code (Ex.Grand Illusion). * In November DC09, HE went to Smaland, Sweden to record and to shoot a music video. This was a top news story featured in "Smaland Sposten" (Smaland Sports Newspaper). * In DC10, "Demon's Rock Tour hakurai" begins. HE is joined by Anders Rydholm(bass) and Ola af Trampe(guitar), two noted Swedish musicians. * On May 21 DC10(2008) HE recived social invitation from the Swedish Ambassador to Japan. They drank tea together. On May 24 DC10(2008) HE was featured as the main color commentator for NHK's English broadcast of the Grand Sumo Summer Tournament. HE is the first non-native English speaker to have accomplished this. 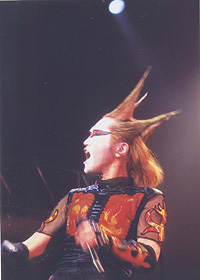 HE is still one of the leading forces in the Japanese Hard Rock scene. For over 10 years, HE has headlined the annual rock event, "Classic Rock Jam" . His Excellency has traveled to over 50 countries, however it must be noted that he had been to at least 14 of these countries before he was 7 years old (in human terms).